I’ve been crocheting up a storm lately! I have lots of finished objects to show you, but rather than blast them all at you at once, I’m going to do it bit by bit. That gives me time to keep making more and we can see just how long I can make the FO Parade last! First up today is an owl I finished just the other day! 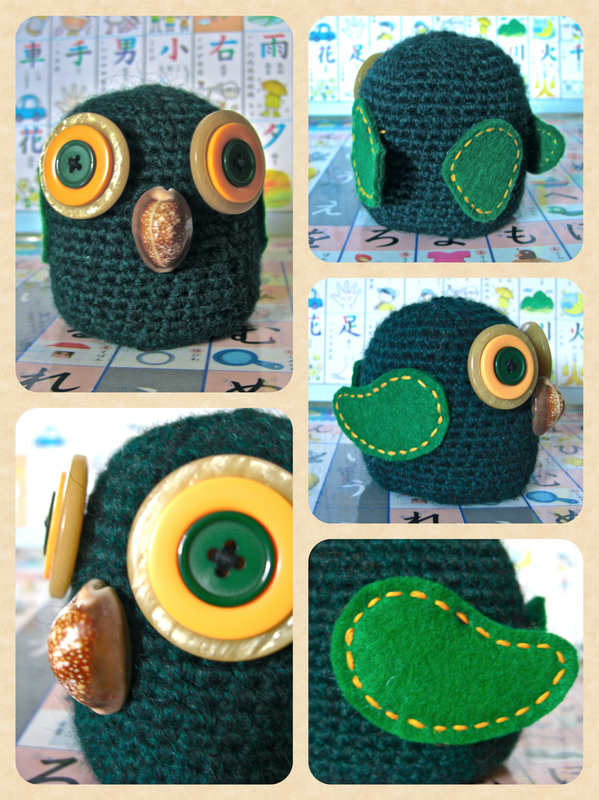 I’d made a smaller owl in this fashion a few years back as gift for a friend, and this is kind of like a bigger, refined version. I named him Nugget because I love how he’s just a little nuggety unit with owl parts. He makes me happy, and is definitely my favorite of today’s line-up. His eyes are made by layering three buttons, and his beak is this bizarre button I had lying around that’s made from a shell! I thought it was just the right shape for a little owl nugget. Trade secret: You know the black rectangles of plastic in the bottoms of environmental shopping bags? To make his little tooshy flat and to keep his wings and tail stiff, I cut the shapes out of that plastic rectangle and then stitched the felt over it, or pressed it into the bottom of his body before I stuffed it. He also has a Gacha machine capsule filled with rice in his center so his nose doesn’t tip him forward. Which is a good way of reusing them, since I am clinically incapable of passing a Gacha machine without getting something. Oy! I have problems. Now, the last one for today, well, I’m undecided what he is. If he’s a dinosaur, he’s part T-rex and part Stegosaurus. But, maybe then he’s a dragon? Who knows? You’ll have to ask him yourself. "Am I a dragon or a dinosaur? I'm so confused!" He was a bit of an experiment, and while I consider the experiment a success, I definitely have my lessons learned for next time. His face could be a lil’ bit cuter, and I might even add claws next time. Meanwhile, I used my Kanji and Hiragana charts as backgrounds for a change. I really like it! It’s a nice change from black or white paper. What do you think? The Shy Lion! 2012! Aaaaaannnnddd…. GO! Crochet Classes at Thread Den! Love, love, love it all. Great idea to recycle the Gacha machine capsules! And I adore the dragonosaur. Charts are a fab idea for the background too. Well done you busy bee. I can’t remember where I got the charts, but I adore them. I feel like I want to say my high school japanese teacher gave them to me, but I don’t think that’s right. How awful of me! Ahhh! So so so adorable! 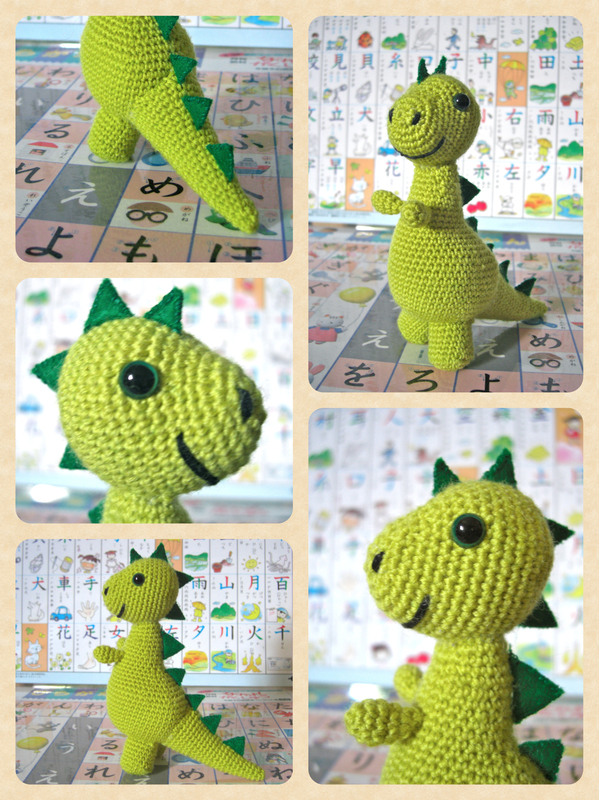 I wish I wasn’t bombarded with orders for hats and scarves so I could make crochet pals. I also wish I could hang out with these guys because they look like they would be lovely friends =} Can’t wait to see what else is coming up! Love the dinosaur- he’s super cute, and the owl is adorable!! i love them both! the background is nice, too. Much more fun than plain paper! I mean, I love me some plain paper, but it’s nice to spice it up! They’re laminated though, so the shine can be a bother sometimes. Pieces cut out of plastic ice-cream container lids work really well for stabilising toys too. AND it’s an excellent excuse to buy ice-cream. “I know we said we’d be healthy dear, but I HAD to buy this Streets Blue Ribbon Chocolate Swirl so I could crochet an owl”. Absolutely! Good plan! Then you can buy the ice cream AND carry it home in a green bag, and then you’re well and truly set! I think he’s an amazing Dino! Dragon? Umm no sorry cuz then his from arms would be on the floor too! 🙂 just sayin.. But I want to hug him and cuddle with him! I know, I should ask u at the tb club house but man he’s adorableeeeeeee! He's not officially for sale just yet, because he's stock for a festival I've been invited to. And he might already be spoken for ^_~ BUT, I'll probably be opening up commissions after the festival is done. Iove the owl. I thinking he’s a dinosaur but the color is reminiscent of pete’s dragon.. If it had wings then it would be a dragon. He is adorable. I’m so glad I happened onto gratefulcrochet’s blog this week to read her men who crochet post – found some awesome blogs to follow. Well, the Year of the Dragon begins in a couple of weeks, so I think that’s a sign!